Growing fruits and vegetables at high altitude presents unique challenges, even for experienced gardeners. But it’s a labor of love for Chrissie Huss. Her interest in food production took root during her time as a Peace Corps volunteer in Senegal, West Africa. After returning to the United States, she went on to intern at Central Rocky Mountain Permaculture Institute and manage a 40-acre community farm outside of Boston. 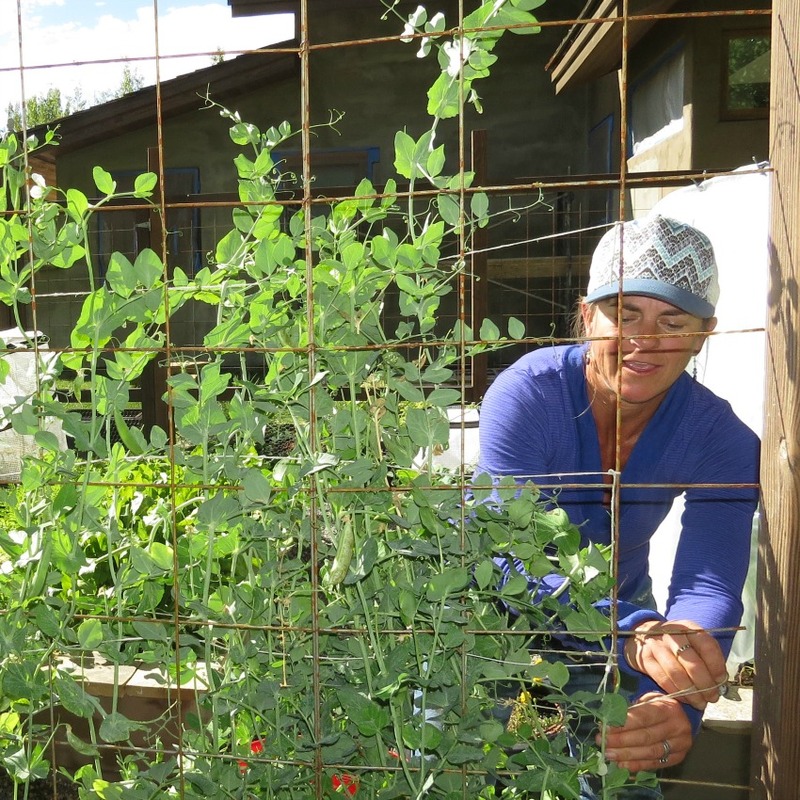 A resident of the Wood River Valley since 2000, she started Edible By Design in 2015 to empower others to grow delicious organic vegetables in their own backyard. How did you become interested in edible gardening? I was first introduced to vegetable gardening as a Peace Corps Volunteer in Senegal, West Africa. I had never thought much about my food, where it came from or how it was grown. As a Peace Corps Volunteer, I was living in a remote village where growing and storing food was a life necessity. I found gardening to be a universal language. It connected me to people of all ages, young and old, and gave me a true sense of place. Discovering gardening was a true gift. What do you love most about growing vegetables? I love the simplicity of planting a seed; watching it grow; and finally, being able to harvest something that feeds my body and soul. Gardening in the Wood River Valley can be challenging. What’s your secret? Patience. I learn something new every growing season. Sometimes it is through my successes, but often it is through my failures. I love thinking about how I will do things differently and/or better the next year. And of course, soil. Healthy soil is the key to all growing success. What’s your favorite food to eat from the garden? Peas! Any kind: shelling, snap, and snow. Peas might be the easiest vegetable to grow and yet have the most noticeable difference in flavor from store-bought vegetables. What do you do with your excess garden produce? Unfortunately, my vegetable garden at home is desperately neglected. When I do have excess produce, I like to share it with friends. With the produce I don’t get around to harvesting, I either compost it to feed my soil later or let it flower and go to seed. The flowers and seeds are great for attracting pollinators and I love finding lettuce, parsley, dill and cilantro volunteered throughout my yard. Most of my clients enjoy sharing their surplus produce with friends and family. Some will preserve their bounty either by canning, freezing, or dehydrating. Finally, I always offer to harvest and donate any excess produce that won’t get used. Jeanne Nolan, owner and founder of The Organic Gardener and author of the book From the Ground Up: A Food Grower’s Education in Life, Love and the Movement that’s Changing the Nation. Jeanne started her own backyard farming business more than 10 years ago in the suburbs of Chicago. Her business has grown from an employee of one to a staff of 25. She is a true pioneer in the local food movement. I heard about Jeanne from a mutual friend for several years and was finally introduced in the fall of 2014. We immediately connected and she inspired me to follow my passion and launch my own backyard farming business, Edible by Design. My goal is to connect people to their food, whether it is growing herbs in a windowsill or dedicating a piece of land to a vegetable garden. I want people to recognize that we can all be active participants in the local food movement, regardless of size or scale. My biggest wish is to see more access to local food for a wider spectrum of the population. I think getting local food into our schools is a huge priority. If we can get the next generation growing and eating fresh fruits and vegetables, we will make great strides in steering away from the processed food industry. I would like to see more of our public spaces used for growing food. I look around our valley and see endless potential, whether it is at our schools, libraries, empty lots, back alleys or parks. Incorporating vegetables in our landscapes should be the norm!